Welcome to edition 415 of Insider Weekends. Insider buying increased significantly last week with insiders purchasing $119.66 million of stock compared to $40.06 million in the week prior. Selling also increased with insiders selling $1.76 billion of stock last week compared to $1.48 million in the week prior. Sell/Buy Ratio: The insider Sell/Buy ratio is calculated by dividing the total insider sales in a given week by total insider purchases that week. The adjusted ratio for last week dropped to 14.69. In other words, insiders sold almost 15 times as much stock as they purchased. The Sell/Buy ratio this week compares favorably with the prior week, when the ratio stood at 36.95. CEO & Chairman Harold Hamm acquired 136,000 shares of this oil and natural gas exploration and production company, paying $65.30 per share for a total amount of $8.88 million. Mr. Hamm increased his stake by 9.58% to 1,555,859 shares with this purchase. 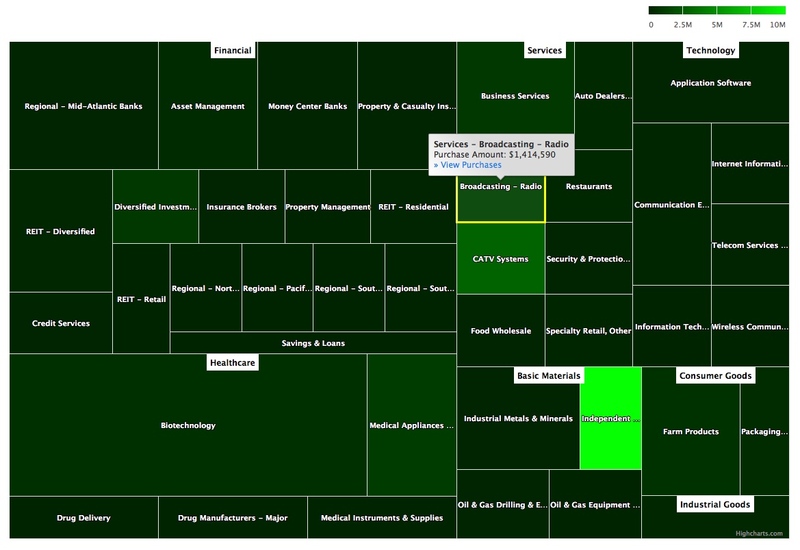 You can view the list of recent insider transactions for Continental Resources, Inc. here. President & CEO Michael T. Fries acquired 100,000 shares of this international television and broadband company, paying $28.91 per share for a total amount of $2.89 million. Mr. Fries increased his stake by 17.49% to 671,905 shares with this purchase. You can view the list of recent insider transactions for here. Director Charles C. Townsend acquired 500,000 shares of this global aero communications services provider, paying $5.06 per share for a total amount of $2.53 million. These shares were purchased indirectly by PAC LLC. It was interesting to see an insider purchase of Gogo a week after we reported nine insiders of competitor Global Eagle Entertainment (ENT) purchased stock. Global Eagle’s stock saw an additional 21% gain last week after a nearly 100% move in the prior two weeks. Gogo’s stock lost more than half its value this year as the company continues to post operating losses and competitors like Global Eagle Entertainment pick up market share in the airplane Wi-Fi services segment. Free cash flow was negative in each of the last five quarters and each of the last five years. You can view the list of recent insider transactions for Gogo Inc. here. Director Stacy G. Smith acquired 25,000 shares, paying $74.13 per share for a total amount of $1.85 million. These shares were purchased indirectly by SCW Capital LP. Director Craig E. Holmes acquired 1,000 shares, paying $74.18 per share for a total amount of $74,183. Mr. Holmes increased his stake by 7.90% to 13,666 shares with this purchase. You can view the list of recent insider transactions for Independent Bank Group, Inc. here. Chairman Emeritus Joseph M. Field acquired 200,000 shares of this radio broadcasting company, paying $7.07 per share for a total amount of $1.41 million. Mr. Field increased his stake by 3.09% to 6,677,381 shares with this purchase. Mr. Field’s enthusiasm for Entercom has not dampened despite a large decline in the stock after first quarter 2018 results missed expectations on both the top line and the bottom line. This was the first quarter of operations after Entercom Communications merged with CBS Radio. For the month of May, Mr. Field picked up 943,062 shares for $7.6 million. You can check out a full write-up of Entercom by Vetle Forsland here or a quick summary on page 14 of Focused Compounding’s letter here. You can view the list of recent insider transactions for Entercom Communications Corp. here. COB and CEO Mark Zuckerberg sold 880,000 shares for $185.97, generating $163.65 million from the sale. These shares were sold indirectly through various entities. Chief Operating Officer Sheryl Sandberg sold 55,000 shares for $187.21, generating $10.29 million from the sale. These shares were sold indirectly through a trust. VP and General Counsel Colin Stretch sold 750 shares for $186.00, generating $139,500 from the sale. Executive Chairman James W. Ayers sold 3,680,000 shares of this regional bank for $39.81, generating $146.49 million from the sale. You can view the list of recent insider transactions for FB Financial Corporation here. Director Anastasios Parafestas sold 1,336,719 shares for $32.12, generating $42.94 million from the sale. These shares were sold indirectly through a trust. Director Ian G. Smith sold 9,950 shares for $31.80, generating $316,448 from the sale. Sr. VP, Engineering Oliver Ian Chrzan sold 6,000 shares for $30.99, generating $185,940 from the sale. Director Evan Clark Williams sold 682,241 shares for $33.57, generating $22.9 million from the sale. These shares were sold indirectly through various trusts and entities. Chief Accounting Officer Robert Kaiden sold 3,641 shares for $35.52, generating $129,337 from the sale. These shares were sold indirectly through a trust. Director James C. Gaither sold 45,000 shares for $253.59, generating $11.41 million from the sale. These shares were sold indirectly through a trust. EVP, Worldwide Field Ops Ajay K. Puri sold 44,900 shares for $250.01, generating $11.23 million from the sale. You can view the list of recent insider transactions for NVIDIA Corporation here. Disclaimer: I hold long positions in Twitter (TWTR) and Entercom Communications (ETM). Please do your own due diligence before buying or selling any securities mentioned in this article. We do not warrant the completeness or accuracy of the content or data provided in this article.